Did you know that skiing is one of the fastest non-motorized sports on land? The world skiing speed record is 158.424 miles per hour! Without the right ski goggles, you can't keep going at that speed for long, or very comfortably. If you want to try to break the world record, or just your personal best, you need to make sure your gear is on point. This includes your ski goggles. You don't want to ski into a tree like some of the ski fail videos floating around the internet because your vision was clouded by cold, relentless wind. That could end in a big pile of hospital bills, broken bones, and shame. To set you up for the most comfortable speed run possible, we want to provide you with all the information you need to find the best ski goggles. But before we get into the ski goggles themselves, we have to discuss the most important aspects of the best goggles. First of all, the goggles have to fit correctly and stay on your head, even at high speeds. If they fall off or they don't fit your head, they will turn into a liability instead of a useful tool. Most goggles come with adjustable straps to solve this problem. The ski goggles have to protect your eyes from high wind speeds, snow, and UV rays. The durability of the goggles also comes into play. You'll find scratch-resistant lenses to be an important trait. They have to last for more than a couple crashes. The goggles should also allow you to see clearly at all times -- except for when you're face down in the snow. They have to protect you from the sun but also from the annoying fog that builds up due to the temperature differences between your breath and the outdoors. Most goggles come with fog-free lenses. But sometimes that's not enough. The overall price range for ski goggles varies a lot. This is due to the variety of brands that bring these goggles to the market. Established brands like Giro and Smith Optics ask much more for their goggles than not-yet-established brands. The price range you'll find on Amazon is $5 to $100,000 (we're not kidding). Most ski goggles won't be in the higher end of this range, but they exist. The typical high-end range is $200, so we have elected to keep our selections around that price, at most. For this list, we looked on Amazon, website reviews of the brands and compared those reviews to our requirements. We also looked at real customer opinions and reviews. After all, who could better know which ski goggles are the best than those who have used the products? The ski goggles that made it to this list are all positively reviewed by the majority of the consumers who have purchased them. So, we know that people enjoy having these goggles and that it improves their ski experience. Most of the ski goggles also come from already-established brands. The Spy Optic Ace ski goggles use the Spy Happy Lens which is their own patented lens technology. This lens features the scoop ventilation system and quick draw change system. The change system makes it easier to switch the lens with another (you get an extra lens with the order). It is an anti-scratch, and anti-fog injected cylindrical dual lens. Which for you means that you will always see clearly while skiing. The downside is that it's flat. This suggests that you'll encounter a little more distortion and glare. With their silicone-ribbed strap and triple layer face foam, these goggles protect you against bruises. These goggles also fit on most helmets. The use of a cylindrical lens is noticeable in the pricing of the product as spherical lenses are more expensive. The product is available on Amazon, Spy Optic store and online retail stores like EVO for $80 to $140. The ski goggles come with a lifetime warranty except for damaged caused by incidents or improper use. 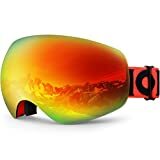 Customers on Amazon, the Spy Optic site and Evo site gave these goggles a combined average of a 4.4 out of 5 stars rating. The most affordable ski goggles on the list are the OutdoorMaster OTG (Over The Glasses) goggles. Especially useful when you wear glasses -- duh it's not OTG for fun -- but can also be used as casual ski goggles. They have unique options with the lens choice as you can choose which percent of VLT (Visible Light Transmission) you want for your use. As with the Sky Optic goggles, the OutdoorMaster goggles also use triple layer face foam and dual lens (with the inner lens being anti-fog). The significant difference is in the model is that the OutdoorMaster goggles are bendable, even the TPU (Thermoplastic Polyurethane) lenses. This makes it also easier to fit on every helmet in combination with the extra long adjustable elastic strap. The downside of the used materials and design of these goggles is that their durability and protection is limited. Protection against damage that is. They do, however, compensate this by giving a one-year warranty (on Amazon). Another downside is that you can't change the lenses, so if they're damaged, you have to get a new one. The OutdoorMaster goggles are available on Amazon, OutdoorMaster's site and eBay for $15 to $30. The goggles are fit for men, women, and children. Just make sure you choose the right size for you. Although consumers seem to like these goggles very much, our rating is lower due to the lack of protection, durability, and quality of the ski goggles. However, the price matches these details. Our rating for the OutdoorMaster goggles is a 3.9 out of 5.0 stars. The Bolle Carve goggles are OTH (Over The Helmet) instead of OTG. They use a unique flow-tech venting system that prevents fog. Instead of using triple-layer foam, the Bolle Carve uses double-layer foam. This means they are a little less comfortable on the face. Additionally, they lack carbon glass. These are available for a price of $20 to $40 on Amazon, Bollé's site and eBay. Compared to the OutdoorMaster OTG, these goggles are a much better choice. For an extra five to ten dollars you get better ventilation and protection. 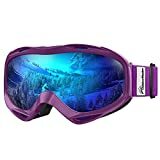 Customers rate these goggles 4.1 out of 5.0 stars. You will immediately notice the craftsmanship of the Smith Optics with their I/OX goggles when you look at the design. These feature enhanced peripheral vision with their spherical carbonic-x lens, TLT (Tapered Lens Technology), 5X anti-fog technology and patented Porex filter lens technology. And they use AirEvac ventilation technology to reduce the fogging up in the lenses. The lenses also can easily be changed thanks to their quick-release magnetic lens change system. The goggles have a Responsive Fit frame design with QuickFit strap adjustment system. They also use triple-layer face foam and is compatible with all helmets. The downside is that you can't choose a size. The company clearly designed them for larger heads. The Smith Optics goggles are available on Amazon, Smith Optics website and online retail stores like EVO for $100 to $230. The cheapest ones are available on Amazon. And all Smith Optics products come with lifetime warranty, even when you crash. The Smith Optics goggles are far more durable than the three goggles listed above. The quality of the lens and the fact that you can change it as needed makes it an optimal choice for durability and protection. With all the extras you get comes an extra price but we think it's still worth a 4.5 out of 5.0 stars. Features a large size semi-frameless adult frame with Expansion View Technology (EXV). The Giro Contact makes use of peripheral vision with a spherical lens that resembles the form of the human eye. On top of that, the glasses feature an anti-fog coating for optimal view. In combination with the anti-fog coating Giro also features EVAK™ Vent Technology to lower the chance of fogging up. For comfortability, they added triple layer face foam to the goggles. Another unique feature that the Giro Contact goggles have is their use of a magnetic lens change system with a button you have to push. Most brands don't have a button, so when you fall with your face in the snow, you're not going to lose your lens with this one. The downside is that Giro goggles are designed to fit on Giro helmets, so it might not fit on another helmet. 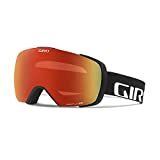 The Giro Contact goggles are available on Amazon, Giro's site and online stores like EVO for $100 to $250. The goggles come with two lenses, one with 50 percent VLT and one with 40 percent VLT. The Giro Contact is much like the Smith Optics goggles. Customers rate these googles 4.5 out of 5.0 stars. Another affordable model is the Zionor X10. The OTG Zionor X10 consists of very flexible TPU. With this flexibility comes the sacrifice of durability. You can easily scratch the lenses. But they do offer 100 percent protection against UV400. The interchangeable lenses compensate for the low-quality design. The Zionor X10 features a spherical lens with panoramic vision and an extra long strap for helmet compatibility. The three-layer face foam enhances comfort, and the anti-fog coating plus two-way venting system prevent these goggles from fogging up. You can find these goggles on Amazon and Zionor's website for between $35 to $50 for men, women, and youth with a one year warranty. The Zionor X10 is slightly better than the OutdoorMaster. Customers rate them 4.0 out of 5.0 stars. The Dragon Alliance X2 goggles have a unique patented frameless design and Armored venting. They come with a large, adjustable silicone strap that fits every helmet. And they have triple-layer foam for extra comfort. The Dragon Alliance goggles are made from injection molded polycarbonate. The anti-fog treated dual lenses add additional visibility and durability. To support the anti-fog dual lens, it also features venting technology that distributes heat equally within the goggles. You have a wide variety of lens choices with different VLT percentages. You can change the lenses so you can fit the appropriate eyepieces to weather conditions. The Dragon Alliance X2 goggles are available on Amazon, Dragon's site and eBay for $80 to $340 with an extra lens. Customers give the Dragon Alliance X2 a 4.3 out of 5.0-star rating. The Oakley O-Frame MX is the only model we have covered with a clear lens. It features the same flexible design as the OutdoorMaster goggles. The scratch-free and impact-resistant lens lets all the sun through thanks to its clear design. Oakley chose to focus on clear visibility instead of protection against the sun's rays. It does offer some protection against UV light, however. This makes it an ideal option if you're not dealing with much sun and want to see everything clearly without getting things in your eyes. You can find the Oakley O-Frame on Amazon, Oakley's site and MX deals for $35 to $55. The downside with this lens is that the sun will most likely blind you when you wear this. For that reason, you may feel this is the worst pair of ski goggles we have covered, depending on weather conditions you will encounter. Our rating is 3.0 out of 5.0 stars. There are two winners on this list, but we want to pick only one. When we compare the Giro Contact to the Smith Optics goggles, we look at the additional benefits they offer. And in that case, the Smith Optics I/OX ski goggles win. With the Smith Optics I/OX ski goggles, you won't have to worry about them fogging up. On top of that, they provide a level of comfort that is unmatched by the others. And if you damage the spherical carbonic-x lens, you can swap it out quickly with a new one instead of buying an entirely new pair of goggles. What is your go-to pair of ski goggles? Have you used any of them on our list? Let us know down in the comments!